Early September we had Jeremy’s parents visit us over the holiday weekend. We had a nice long weekend filled with a picnic along the Snake River, visiting the Moscow farmers market, checking out Uniontown’s artisan barn, and relaxing on the porch. After we had our terse goodbyes we realized it was lunchtime by the rumblings of our stomachs. I quickly opened Yelp and searched vegan. 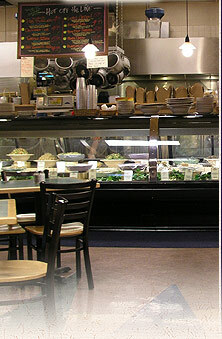 There were quite a few options within a few blocks of I-90 and I chose Huckleberry’s Natural Market. I thought we might pick up pre-made sandwiches or a pile of fresh veggies and a drink. We used the restroom and circled the store for a few minutes but nothing quite called out to us. That’s when we spied the in-house 9th Street Bistro. They had what seemed like a million vegan options (here’s their menu). Woo hoo! 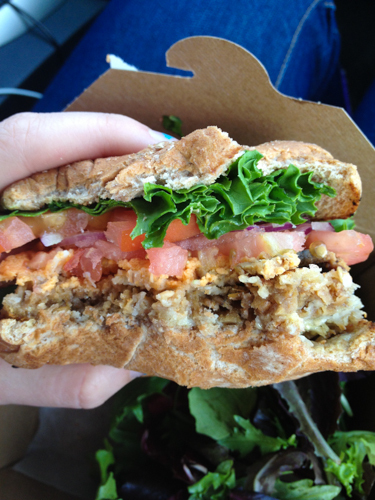 Field roast cutlet, tempeh, celebration roast, vegan cheddar, vegan mayo, lettuce, tomato, onion, whole wheat bun. I chose the Herbivore Burger but they were out of Field Roast cutlets that day so I had an option of like 3 or 4 other vegan burgers to choose from. I went with the coconut burger. I’m sad to say I don’t remember if it was house-made or from a distributer like Field Roast, but it was DELICIOUS! Maybe the best vegan burger I’ve had. Coconut on a burger? I’ve never heard of such a thing! I really must try to recreate this at home. The burger came with a small garden salad and balsamic dressing. I could only eat half of it at the time and nibbled on it the rest of our drive back home through Spokane and Coeur d’Alene. 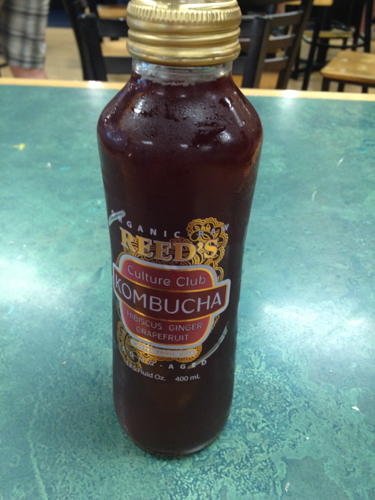 I also bought a kombucha that was really good, hibiscus ginger. Jeremy had a sandwich and a juice from the juice bar (menu) – both were also delicious. So, if you’re in that area – I highly recommend stopping by to grab a bite or grocery shop. Here’s a list of their locations. I was thrilled to find that we have one very close by in Moscow, we might even head there this weekend.